The first five game Saturday AFL slate of the year is set to be a massive one this weekend, headlined by the first Perth Derby of the year between the Eagles and Dockers! In fact, all five games promise to be exciting affairs, and we have you covered with a full preview and betting tips for each game! The Cats moved to 3-0 on the season with a fantastic win over the Crows in Adelaide on Thursday night. They’ll be on a long eight day break and should be ready to fire against the Giants on Saturday afternoon. The Cats will welcome the return to GMHBA Stadium, where they punished the Melbourne Demons by 80 points in Round 2 and where they have not lost a game in their last eight. The Giants also secured a big win in Round 3 as they downed the Tigers at GIANTS Stadium by 49 points to move to 2-1 on the season. Jeremy Cameron was fantastic in the win, racking up 30 disposals, 9 marks and booting 7 goals to lead the Giants. Jeremy Finlayson relished the new role up forward, kicking five goals and looking like an elite rangey, medium sized forward. Extremely tough game to call here. The Giants offence looked on another level against the Tigers on the weekend, however, the Tigers defence is a rabble at the moment and Geelong should pose a much tougher challenge. Geelong’s dominance at GMHBA Stadium has them as $1.38 favourites here and it’s hard to side against them, especially with the eight day break compared to just five six for the Giants. The Bombers captured their first win of the season in Round 3 as they downed the Demons on Friday night. Slick ball movement through the middle of the ground and a high risk/reward game plan paid off the Bombers as they booted 20 goals to win the game. Shaun McKernan, Jake Stringer and Anthony McDonald-Tipungwuti booted 12 goals between them while Dylan Shiel looked the class midfielder on the ground with 31 touches. The Lions continues their fantastic start to the season in Round 3, defeating the Power by 17 points to remain one of just two undefeated teams in the AFL (Geelong). Lachie Neale could well have nine Brownlow votes through the first three games after racking up 43 touches and a goal in the win. 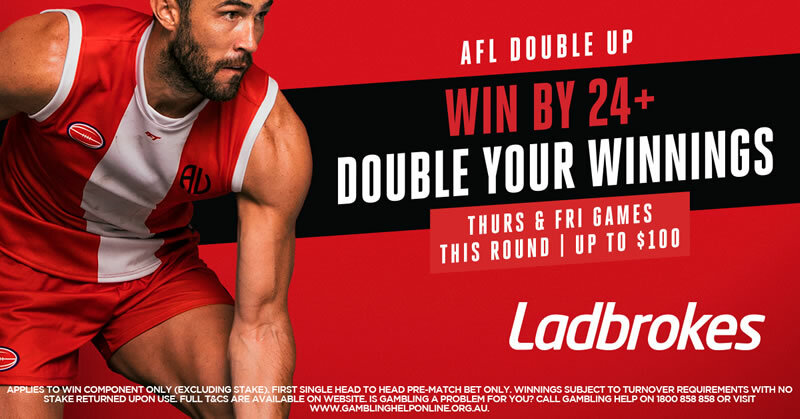 The Lions are arguably the most exciting team to watch in the league at the moment and they’ll fancy themselves a massive chance to go 4-0 and beyond with games against the Bombers, Pies and Suns in their next three. Two of the Lions big wins this season have come at The Gabba. They were arguably outplayed by the Kangaroos in their only away game so far this season before a seven goal last quarter snatched the win. We think they are still quite unproven away from home and think the Bombers should be a big chance here. Back the Bombers at Sportsbet as a strong start and a 12 point quarter time lead is a likely scenario. The Power come into this game off their first loss of the season last weekend. They lost an arm-wrestle against a red-hot Lions outfit who proved too strong in the clutch. It was far from a bad performance from Port who now sit in eighth spot on the ladder with two wins and one loss. Despite the loss, Ken Hinkley will field an unchanged side from Round 3, which also means that Tom Rockliff (concussion) has responded well from his knock against the Lions. The Tigers have had a nightmare start to 2019 and it doesn’t look like getting better anytime soon. They were thumped by a rampant GWS outfit last weekend, which was their second loss in three rounds. More bad news for the Tigers is the suspension to Dustin Martin (one week), who will join key pillars Jack Riewoldt (wrist) and Alex Rance (knee) on the sidelines this weekend. The Power come into this as the red-hot favourites with the bookies setting the line at 25.5. Considering the form and injury struggled of the Tigers, we see this line as at least 10 points too short. Expect to see Port to bounce back at home with a dominant win. Bitter start to the season for the Roos. After a Round 1 demolition job at the hands of the Dockers in Perth, the Roos suffered losses to the Lions and Hawks in the following two rounds to fall to 0-3 on the season and currently sit above only Melbourne on the ladder. There hasn’t been much to get excited about for Roos fans. They have scored just 59, 87 and 71 in their three games and while they have been competitive defensively in Round 2 and 3, they have really struggled to kick a winning score. The Crows fell to 1-2 in Round 3 as they were defeated by Geelong at home on Thursday night. They have copped a pretty rough schedule to open the season with games against the Hawks, Swans and Cats. They’ll welcome a likely change of pace over the next four weeks as they line up against the Roos, Suns and Saints which should most likely move them to 4-2. Brad Crouch has been a real shining light in his return from injury for the Crows. The dynamic midfielder has averaged 29.6 disposals and over 1 goal per game in the opening three rounds. Away from home, the Crows start as just 9-point favourites, which we think is free money this weekend. Don’t read too much into the Crows 1-2 start, they were rusty in Round 1, dominant in Round 2 and came up against arguably the best side in the comp in Geelong in Round 3 and were super competitive. The West Coast Eagles have found the form that saw them win the 2018 AFL Premiership over the last two weeks. After a disappointing Round 1 loss to the Lions that can be put down to rust and travel, the Eagles have come out and dominated two sides who have looked to be amongst the best in the competition in GWS and Collingwood over the last two weeks. Andrew Gaff was fantastic in his return from suspension, racking up 35 touches and five clearances in the win. The Dockers currently sit third on the AFL ladder as the highest ranked 2-1 team in the league. A big win over North Melbourne in Round 1 boosted their percentage but a disappointing loss to Gold Coast in Round 2 followed by a win that could only be described as lucky in Round 3 against the Saints dropped their stock a touch. The Dockers were dealt a massive blow in Round 3 as skipper Nat Fyfe was forced to leave the ground with a concussion in the third quarter. Protocol will likely mean Fyfe misses this week against the Eagles, however, time will tell. For what seems like the first time in a few years, the Eagles are almost full strength. They are, of course, still missing ruckman Nic Naitanui but apart from him the Eagles are fit and firing. At first glance the 35.5 point line seems a little high, however, the Eagles have won four of the last six derby games by 30+ points and with the potential for Fyfe to be out of the line-up. Still not convinced in the large line but the total points does catch our eye here. 158.5 seems a little low considering the last three games between the two teams have surpassed this mark and the Eagles have averaged 101 points in their last two games.